A Cleveland Heights woman is demanding changes after she claims a rock fell from a train trestle and smashed her car's windshield. 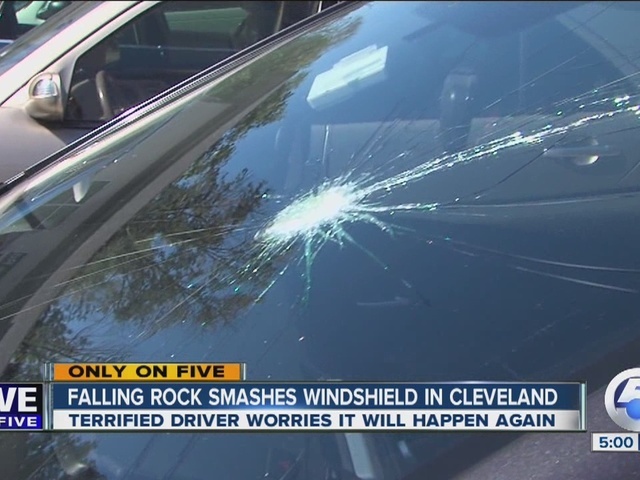 Mark K. Robinson told newsnet5.com the rock fell from a bridge above Martin Luther King Jr. Drive near University Circle in Cleveland while she was driving to work Wednesday evening. Glass rained down on her and shattered her windshield. "It sounded almost like a gunshot," Robinson said. She filed a police report on Thursday in Cleveland. newsnet5.com did some digging and found federal records proving CSX owns those rails where the rock possibly fell. A CSX spokesperson said safety is their highest priority and now that they know about it, they will investigate. The bridge was last inspected in January, a CSX spokesperson told newsnet5.com. Federal law requires railroad operators inspect their bridges at least once a year. newsnet5.com also reached out to the city of Cleveland to ask what they could do to make sure the road underneath remains safe for drivers and pedestrians. A public works spokesperson said she would get back to us. Robinson said, the trail of large rocks lining the street below show this is not a new issue. She said it's evidence of Cleveland's crumbling infrastructure that is putting lives at risk. "Someone easily could die from this," Robinson said. "This is definitely a safety issue and this is a main corridor. We have all this invested interest in putting a new facelift on Cleveland because the Republicans are coming. What about the citizens of Cleveland? Come on."